Compo, a resident startup of the Skolkovo Foundation, has raised 200 million rubles ($3.5 million) in investment from VEB Innovations, a tech investment fund set up by Vnesheconombank. The startup, a resident of Skolkovo’s advanced manufacturing, nuclear and space technologies cluster, has developed electronic shelf labels whose display can be updated remotely, effecting changes throughout the store instantly. Cosmo says its electronic labels are cheap, durable, easy to install and simple to use. Alexander Belous, director general of Compo, demonstrating the electronic labels inside Skolkovo Technopark. Photo: Compo. The technology has undergone pilot testing in major Russian retail chains, and its commercial launch is planned for the end of this year. The system will enable retail chains to increase trade turnover by 3-5 percent, Alexander Belous, director general of Compo, told Sk.ru. “Electronic shelf labels in retail make it possible to significantly increase economic efficiency, and to automate data collection, record-keeping and planning,” Belous told Sk.ru, adding that retail automation technology also makes it possible to provide navigation systems for shoppers to help them find individual goods. The partnership with VEB Innovations will allow Compo to make use of VEB group’s contacts and infrastructure throughout the world, which will facilitate its entrance to international markets, the startup believes. Compo plans to supply up to 20 million electronic shelf labels a year. “Such technologies create a basis for the development of retail trade in our country that fully corresponds to the logic of the digital economy, and forms the basis for the entrance of Russian tech companies into external markets,” said Kirill Bulatov, director general of VEB Innovations. “Today, the automation of processes and their move over to digital format is one of the most interesting areas of tech development for investors; for example, the U.S. company Amazon and China’s Alibaba have launched several checkout-free stores,” said Bulatov. 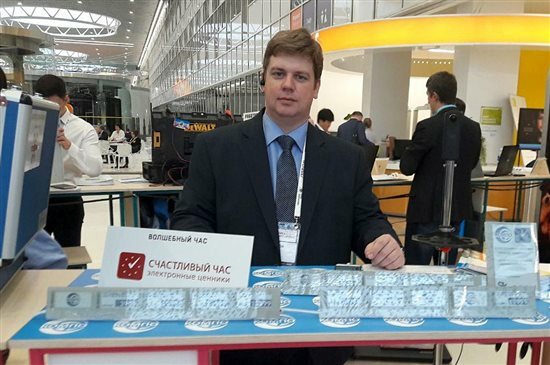 The Russian market alone could see demand for more than 150 million electronic shelf labels, believes Vladimir Puchkov, acceleration director within Skolkovo’s advanced manufacturing, nuclear and space technologies cluster.